Casa Trallero is a traditional Aragonese house, several centuries old. It is surrounded by a part of green zone and located in the highest part of the town. Its owners are dedicated to agriculture and livestock. It has been recently refurbished to offer three charming apartments. The rehabilitation has been done with traditional materials such as wood, stone and ceramic and following a rustic style, also with decorative elements, some old ones from the farmhouse itself, and a warm and cozy atmosphere has been achieved. Hot water and central heating in all apartments, with independent thermostats. - Apartment 1 - For 4 seats. - kitchen - living room with television and sofa bed. - The kitchen is fully equipped with kitchenware and microwave. - Two bedrooms, one double and one double. - Bathroom - Central heating. - Terrace - Garden with table and stone benches and barbecue. - Parking in the same farm. - Apartment 2 and 3 attic. - Of 4 seats each. - They have a fully equipped kitchen lounge - The kitchen has a ceramic hob and oven as well as a microwave. - One double bedroom, another double - A bathroom - The apartments have an equipped terrace and independent barbecue for each one. 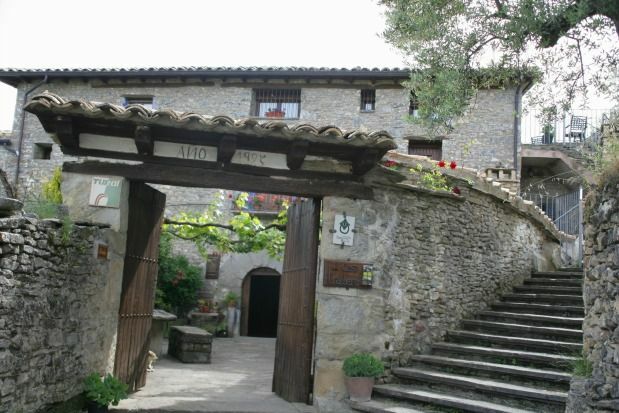 - Guests can also use the large patio of the family home where they will enjoy the freshness and flavor of the traditional agricultural houses of the Aragonese Pyrenees.